Today, multiple companies are tackling the development of an autonomous vehicle of level 5 autonomous driving, i.e., an autonomous vehicle that can drive itself autonomously without a driver. The present autonomous driving technology relies on GPS functions, maps, and sensors. However, an autonomous vehicle of level 5 autonomous driving must take responsibility for protecting a human life. For that reason, such an autonomous vehicle is required to bear decision-making capability and image recognition capability approximating that of a typical human driver as a multiplex safety technology. Nevertheless, real time image recognition is difficult on an embedded system based on existing microprocessors, so that technological innovation using FPGAs is required for achieving this target. Accordingly, this FPGA design competition is intended to bring ideas of FPGA researchers together to encourage studies of FPGA technologies necessary for level 5 autonomous driving of the future, and to accelerate the implementation of level 5 autonomous driving. A contestant is requested to arrange for an autonomous vehicle controlled by an FPGA on the miniature roads shown below, running it without straying off the road, running it along a route as instructed, and sequentially completing given tasks such as recognition of traffic lights, recognition of a crosswalk, recognition of an intersection, recognition of an obstacle, and recognition of a pedestrian (doll). It is not mandatory that all of these tasks are completed. Nevertheless, each contestant should strive to develop an FPGA algorithm so that as many tasks as possible can be completed. 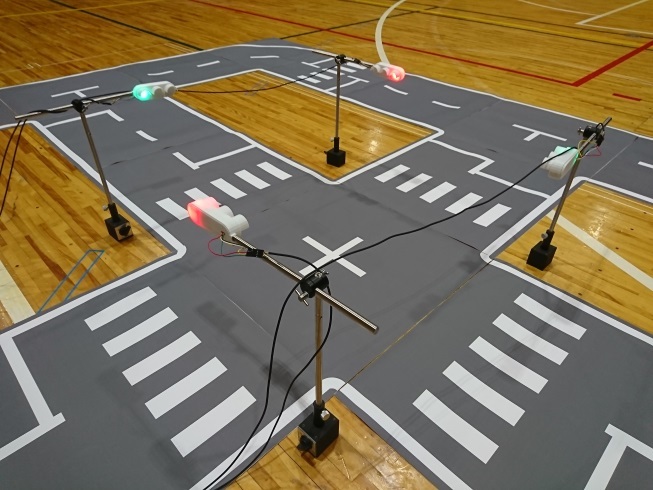 Moreover, a car should be designed to be able to respond to any environment robustly to the greatest degree possible because this design competition simulates the travelling behavior of an actual vehicle. The car body may be made of any material. 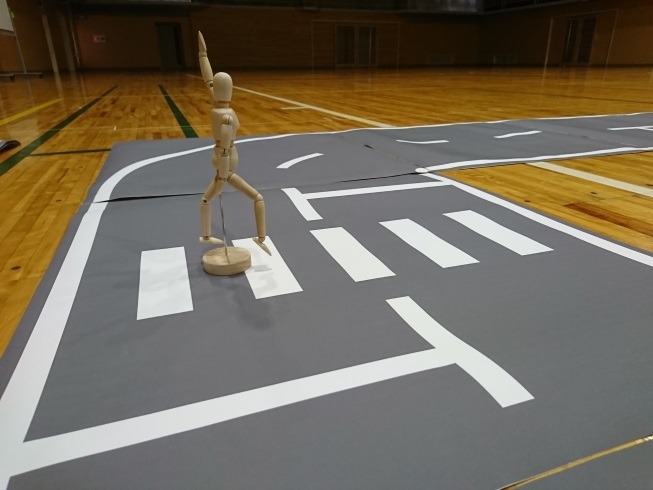 However, the body should be sufficiently small that it does not extend beyond the lane of the road used in the FPGA design competition. It is strongly advised that CCD/CMOS cameras should be used. Any other type of sensor (light, ultrasonics, electromagnetic waves, etc.) may be used together. 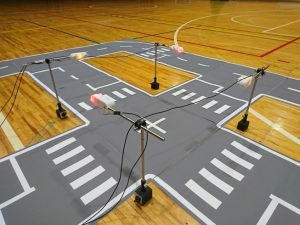 Nevertheless, autonomous vehicle using only CCD/CMOS cameras will get a higher score than autonomous vehicles using other types of sensors or using CCD/CMOS cameras and the other types of sensors together. Make sure to install the algorithm into the FPGA. There is no restriction for the type of the FPGA. A car should be designed to be operable with a battery of a watt-hour rating of less than 100 Wh including the drive power of the motor. Remote transmission and reception of information and remote control of a car are strictly prohibited. Algorithm Any algorithm can be used. However, the algorithm must be implemented inside FPGAs. Use of hard macros in FPGA Anything, even a hard macro processor, can be used as long as it is in the FPGAs. On-board memory External memories mounted on the FPGA board can also be used with no restriction. Battery The whole system should be designed to be operable with a battery of a watt-hour rating of less than 100 Wh. Modification of connectors of a lithium ion battery is prohibited. You must use a standard commercial product. The car specifications should be set in order to bring it on a plane. Sensors There is no restriction on the use of various sensors (light, ultrasonics, electromagnetic waves, etc.) other than CCD/CMOS cameras. 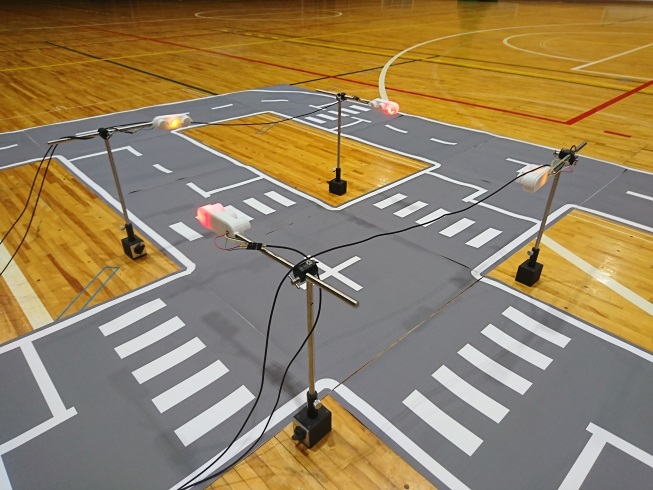 However, an autonomous vehicle using only CCD/CMOS cameras will earn a higher score. If different combinations of sensors are used according to tasks, make sure that unused sensors can be removed. (Note) A sensor is judged to be IN USE whenever it is found on a car. 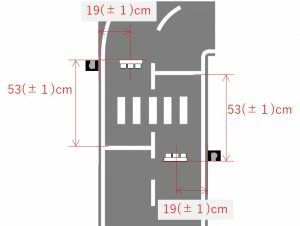 Dimension of car Preferably around 20 cm (length) × 20 cm (width). Speed of car The car speed is not included in the evaluation criteria. Nevertheless, each task should be completed within a set time limit (3 minutes). Remote operation Remote communication with a car and remote control of a car are prohibited. 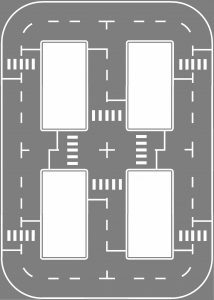 Running patterns on the roads are described below. It is noteworthy however, that a task unannounced beforehand other than the following patterns will be given in the final contest. It is advised that every imaginable safety technology should be incorporated into the participating car because this technology development will contribute to a society in which travelling autonomous vehicles never cause an accident. 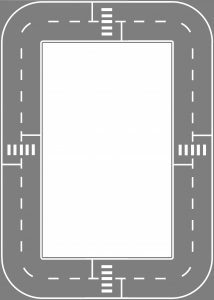 Example 1: Run on the left lane. This task is completed by running end-to-end. Straying into the right lane or running off the road shall cause deduction of points. 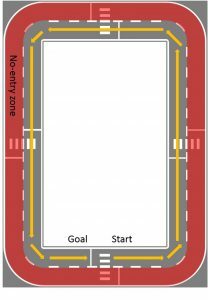 Example 2: Make one circuit of the course. Travel in the left lane. Straying into the right lane or running off the road causes deduction of points. 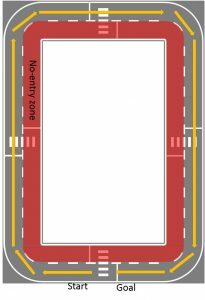 Example 3: Run along a route to be shown on the day of the FPGA design competition according to the instructions. Travel in the left lane. Wrong routing, straying onto the right lane, or running off the road causes deduction of points. 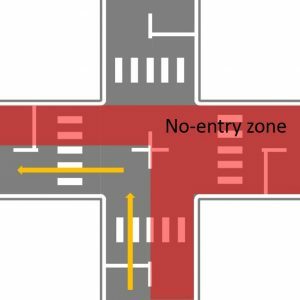 Example 4: Turn at an intersection. 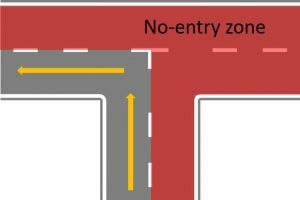 Red areas denote No-entry zones. 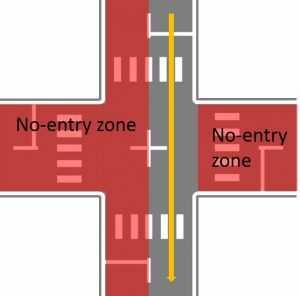 Running into red regions or no-entry zones when turning at an intersection causes deduction of points. 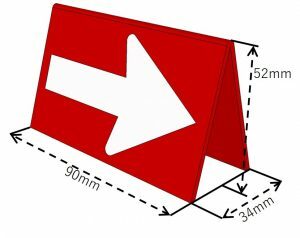 The examples below represent cases of going straight, right turn, and left turn. Example 5: Take an evasive action to avoid an obstacle in the left lane. 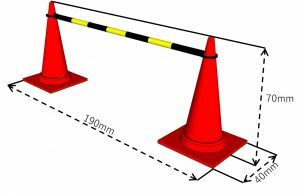 The right lane may be entered at one division (70 cm) ahead and behind the division of the obstacle, but may not at more distant divisions, as presented in the figure below. 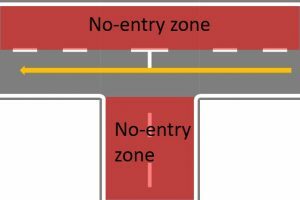 Do not enter red regions (No-entry zone) in the figure. Ignore any obstacle in the right lane. In this case, making a stop causes deduction of points. 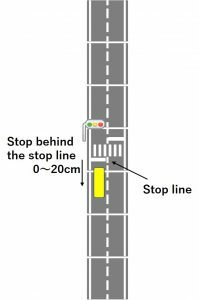 Example 6: Stop at a red light within 0–20 cm behind the stop line. 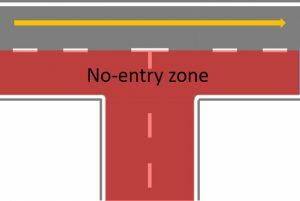 Failure to stop behind the white line causes deduction of points; no stopping at a red light also causes deduction of points. Run through an intersection or a pedestrian crossing at a green or yellow light. Making a stop at a green or yellow light causes deduction of points. 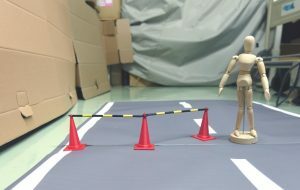 Example 7: Remain at rest behind the stop line when a pedestrian (immovable doll) is walking in the crosswalk until completion of crossing. (Fig. a). Make sure to stay at rest even while a pedestrian is walking on the crosswalk in the right lane, not in the driving lane (Fig. b). 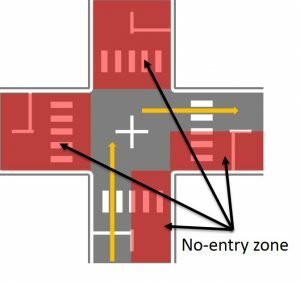 Furthermore, make a stop at a crosswalk without a traffic light when a pedestrian is waiting (Fig. c). 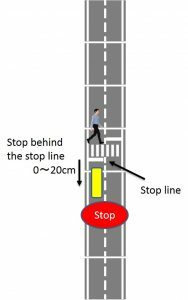 Run through when a pedestrian is standing still waiting for a chance to cross the road at a roadside without a crosswalk (Fig. d). 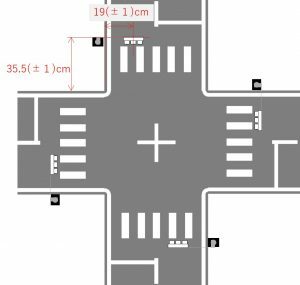 At a crosswalk with a traffic light, when a pedestrian is found crossing the road ignoring the traffic light, make a stop behind the stop line irrespective of the indication of the traffic light (Fig. e). When a pedestrian is found waiting near a crosswalk with a traffic light, obey the indication of the traffic light (Fig. f), i.e., run through with a green light and make a stop with a red light. 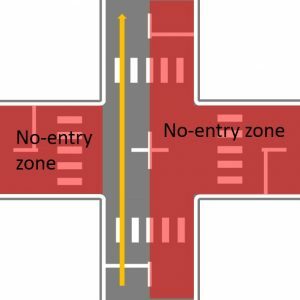 Make a stop before a pedestrian who is crossing on the road without any crosswalk and without any traffic light regardless of the pedestrian’s position. (Figs. g and h). 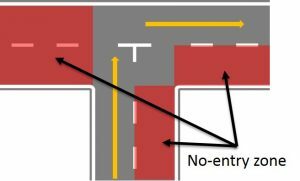 Don’t circumvent the pedestrian and don’t go through the pedestrian. 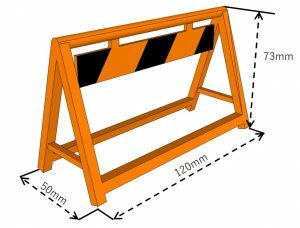 Road segment data are prepared as PPT data of A0 size (841 mm × 1189 mm) in a Microsoft Powerpoint® file. 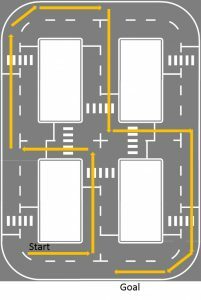 Printing out the road parts and putting them on the floor in proper order will reproduce roads identical to those used in the FPGA design competition. 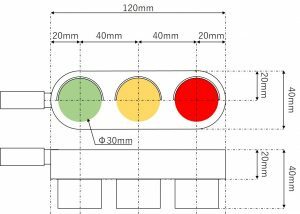 Traffic light model used for the FPGA design competition is shown in the following figures. 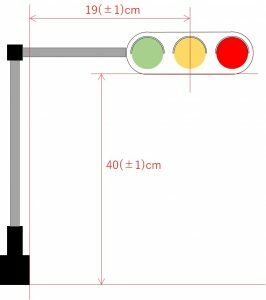 The height of the traffic light from the ground is about 40 cm. (a) Blue light turns on. (b) Yellow light turns on. (c) Red light turns on. In this competition, dolls are used as human. 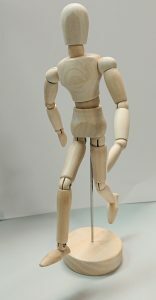 The doll model used in this competition is shown in the following figures. The doll might wear clothes and will take any pose. The height is about 20 cm. Obstacle model used for the FPGA design competition is shown in the following figures.